Pakistan has warned it will retaliate if India takes military action against it after a militant attack on Indian forces in Indian-administered Kashmir. 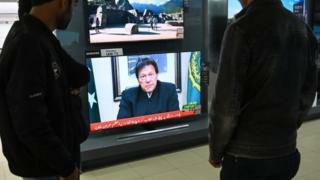 Prime Minister Imran Khan went on television to call on India to provide evidence to support its claims that Pakistan was involved. More than 40 members of India’s security forces died in Thursday’s suicide bombing on their convoy. Pakistan-based militant group Jaish-e-Mohammad said it was behind it. The attack has raised tensions between India and Pakistan, which have fought two wars and a limited conflict in the region and are both nuclear powers. In his first comments addressing the attack, he said India should “stop blaming Pakistan without any proof or evidence” and urged Indian authorities to share any proof they might have about Pakistani involvement. “If you think that you will launch any kind of attack on Pakistan, Pakistan will not just think about retaliation, Pakistan will retaliate,” he said, adding that only dialogue could help solve issues in Kashmir. Viewpoint: How far might India go to ‘punish’ Pakistan? India has long accused Pakistan of backing militant separatists in Indian-administered Kashmir. Mr Khan, who took office last year, said his government was ready to co-operate with India in investigating the attack and asked what benefit Pakistan would derive from the attack at a time when the country was “going towards stability”. The prime minister said he had not addressed the attack earlier because of Saudi Crown Prince Mohammed bin Salman’s high-profile visit to Pakistan on Sunday and Monday. The suicide bomber has been identified as a young man from the region. Correspondents say a significant number of young Kashmiris have joined militant groups in recent years. Earlier, India’s top military commander in Kashmir, Lt Gen KJS Dhillon, accused Pakistan’s Inter-Services Intelligence (ISI) spy agency of “controlling” the attack with Jaish-e-Mohammad commanders, but he provided no evidence. On Monday, India said it had killed three members of Jaish-e-Mohammad in a gunfight that also left four Indian soldiers, a policeman and a civilian dead. 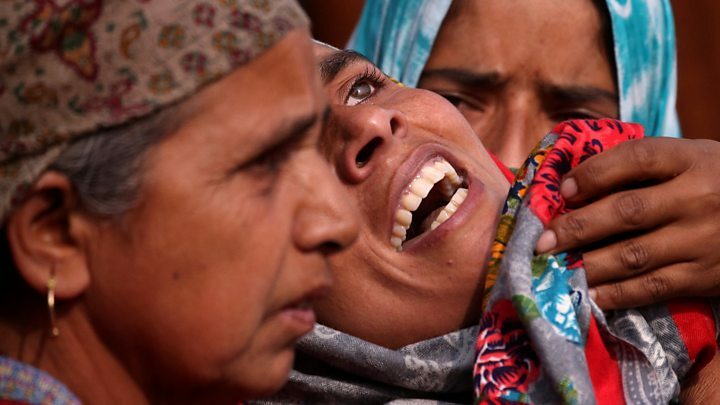 Thursday’s bombing was the deadliest attack on Indian forces in the region for decades. So far India has focused on retaliation by economic and diplomatic means. It has revoked Pakistan’s Most Favoured Nation trading status and raised customs duties to 200%. Both countries have recalled top diplomats. How else might India retaliate? Prime Minister Narendra Modi, who is facing an election later this year, has vowed a strong response and says he will give the military free rein. The last time an attack on Indian forces close to this magnitude occurred in Kashmir was in 2016, when 19 soldiers were killed at a base. In response to that, India carried out “surgical strikes” which involved Indian soldiers crossing the de facto border to hit Pakistani posts. Media captionWhy has 2018 seen a spike in violence in Indian-administered Kashmir? This time heavy snow in the region could make that kind of limited ground response impossible, analysts say. But there are fears that going further – with air strikes, for example – could lead to Pakistani retaliation and a significant escalation.